World Inc. is a timely and useful addition to both the corporate social responsibility and the product development literatures. It is also well-grounded in the realities of business, thereby justifying its space on the shelf of general management literature. The theme of corporate social responsibility continues to grow in visibility around the world, and it has a remarkable ability to energize both its proponents as well as its detractors. The world I work in — international capital markets — seems to be more populated with the latter camp: the sceptics and agnostics, rather than the advocates. A standard position of the sceptic is that if a company acts within the laws of its jurisdiction of domicile, it is fulfilling its social contract and is therefore socially responsible. While many of those active in advocating greater corporate responsibility might find this perspective overly simplistic and visionless, it is nonetheless the case that this viewpoint must be understood when thinking about how much of the traditional investment world regards the responsibility of business to society. This is beginning to change, particularly as SRI funds build assets under management, and as more traditional mainstream funds explore aspects of social and environmental performance looking for clues of under- or over-valuation. Moreover, promising developments such as the UN's recently launched Principles for Responsible Investment should give fresh wind to the sails of those promoting greater awareness of environmental, social and governance issues in the investment decision-making process. 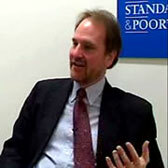 However, barring an immediate and large scale crisis linked to social or environmental lapses by business — something none of us would wish for — it is unrealistic to simply expect the mainstream investment world to suddenly and immediately abandon its traditional approach to investment analysis to accommodate social and environmental factors as primary drivers or ends unto themselves. For those wishing to promote more of a step change in how mainstream investors might regard a company's broader social performance, the challenge is to learn to express these issues in the language of business and finance. 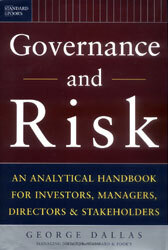 Two key items of business language in this regard are risk management and sustainable competitive advantage. At Standard & Poor's, a global independent research firm, our focus is on the risk side of the equation, and we frame corporate governance in terms of risk and risk management. As an institution, we advocate good corporate governance and corporate responsibility as core values, and believe these factors are important to promoting healthy and efficient capital markets, while also carrying broader social benefits. But we also believe that bad corporate governance is a risk factor that can negatively impact a company's shareholders and creditors, and this form of risk is what we focus on in our own analytical products and services. The investors who use our analytical services and risk assessments may not want to put on their own shoulders the broader responsibilities of addressing the world's social problems. Most of these institutional investors are simply seeking to maximize their investment returns subject to specific risk tolerances, and some might even view social issues as a potential distraction to the achievement of their fiduciary responsibilities to the retail investment client. However, these mainstream investors may have a different take if issues of social and environmental sustainability can be understood in terms of the sustainability of the individual companies they invest in. This can be expressed in the language of avoiding risks such as employee disruptions, lawsuits, loss of customers and loss of brand value. Apart from looking at corporate responsibility from the sometimes dismal angle of risk management, there is also the possibility to frame it more positively, namely from the strategic standpoint of building sustainable competitive advantage. This is a roundabout, but not an irrelevant, way to conclude the new book by Bruce Piasecki, World Inc. With his focus on product development — a practical process endemic to virtually all corporations — Bruce builds the case for progressive companies, as a matter of long-term strategy, to create more socially responsible products and services. He argues to reconcile the twin, and sometimes conflicting, objectives of creating social value and well-being for consumers on the one hand, while, on the other hand, also building sustainable competitive positioning and long-term value for businesses and their investors. Bruce clearly is grounded with a values-based approach to the role of business and society; this is the legacy of his longstanding work in the field of environmental management. However, and critically, he is also pragmatic in his recognition that enlightened self-interest on the part of corporations will be key for Social Response product development to take off on a scale of significant proportion. And he makes considerable use of practical case studies from Toyota, HP, GE, Whirlpool and others. Bruce is speaking to business in their own language of long-term value creation, and recognizes that this must be "win-win" if Social Response product development is to have meaningful traction in the mainstream business community. In his chapter on leadership, Bruce mentions a paradox felt by some of civilization's greatest heroes, such as Abraham Lincoln. Individuals today also feel a new paradox. We want to invest for the best return, but also want the best food, water, air and society for ourselves and for our families. Is it possible to have both? The focus on Social Response product development takes this issue head on, and it may have as much, if not more, impact than socially responsible investing (SRI), at least in the near term. It may be the case that as individual consumers we will internalize to a greater extent the importance of using products that are both healthy for us and for our environment than we might focus on these aspects in the investing side of our lives. For example, we may choose as individuals not to smoke cigarettes for health reasons, but may have a more relaxed attitude about our investment portfolio including shares of tobacco companies. In other words, financial assets can be a bit abstract to us as individuals, whereas the daily use of basic products and services arguably has a more immediate impact on our lives. All successful companies will want to understand the needs and desires of those who use their products if they want to maintain their existing customers and compete for new ones — regardless of whether they position themselves as having a conscious strategy of corporate citizenship. In this context, at least until social investing becomes more widespread, the growing voice of socially-minded consumers to demand responsible goods and services is perhaps more likely to have impact in corporate decision-making and corporate actions than the voice of socially focused investment funds. Against this background, World Inc. is a timely and useful addition to both the corporate social responsibility and the product development literatures. It is also well-grounded in the realities of business. Just as the German philosopher Hegel framed historical advancement as the creation of the synthesis from the opposite forces of thesis and antithesis, this book encourages us to harness and harmonize the potentially contrasting forces of social well-being and business self interest. With its fundamental postulate that values-based product design can contribute to more competitive and successful products, this book offers a positive vision for businesses, their investors and the intelligent and "responsible" consumer — all these parties are needed to establish and support the demand for better products to create a better world.